Mark your calendars: the countdown to the end of the smartphone - as we know it - has begun. This isn’t news. In fact, it’s been ticking down for some time now, heeded by the advance of augmented reality (AR), artificial intelligence and other cognitive technologies. As technology continues to rapidly advance, the mediums that we use to communicate must evolve too, limiting the smartphone’s timeline. I believe we’ve seen the age of smartphones peak due to the changing nature of how we use these devices and the hardware’s struggle to keep up with emerging technology, namely AR and the many opportunities it offers to us all. In fact, it’s hardly relevant to call these devices ‘phones’ anymore as more and more Brits favour internet services over basic telephone use. In fact, an ecosystem of social media marketing is rapidly growing around various aspects of the smartphone excluding the phone: the camera, image editing suites, content sharing functions and social media. As digital marketing strategies prioritise creating visual assets, and with smartphones being used to deliver ever-increasing imagery and video content to consumers, a better description for these devices is ‘internet-enabled cameras,’ and the best use for them is creating and sharing content. Tech leaders within their respective forums - Facebook F8, Apple WWDC, and Google I/O - increasingly talk about the way in which AR will change our lives. These giants have highlighted the new capabilities they’re building around this technology, and their efforts are largely headed towards bringing brands closer to the individual through AR which enables more immersive and visual marketing campaigns. Advancements, such as enabling Facebook Messenger with AR capabilities or the increasing popularity of 360-degree imagery, break the boundaries of text and create a more personal and interactive experience between consumer and brand. AR has many benefits which we can begin to see affecting our everyday habits. There are already apps out there like Glasses by Warby Parker, which enables people to virtually try on frames before they buy, Olay Skin Advisor which analyses an individual’s skin type to find the best care products, or L’Oreal’s Style My Hair feature, embedded on its website, which discovers cosmetics and styles that suit a person best. Highly intuitive and user-friendly, retail is a perfect place for AR; online shopping takes on a new meaning when individuals can virtually try on everything from glasses to nail varnish from the comfort of their home. Increasingly, the retail industry is relying on interactive vision, enabling consumers to try on clothing or measure their rooms and objects through their smartphones as seen in newer iPhones and iPads. While entertaining and highly functional for the e-commerce industry, the growth of AR adoption also holds implications for a number of other uses, from how we interact with brand marketing to education and training programmes. Primarily visual and more engaging than static content, AR has huge implications as an edtech resource as it helps to promote better retention than book-based learning, and can be expanded to visualise complicated tasks prior to learning-by-doing approaches, paving a new path for medical training, construction or engineering. AR will eventually become part of our everyday lives and developers are already hard at work to construct an ecosystem of AR apps that lay the groundwork ahead of a mass-launch of AR-enabled devices. However, the hardware of current smartphones limits developers from taking full advantage of the software’s unlimited capabilities due to the lack of an appropriate AI processing chip, meaning tech companies must optimise yet another new generation of hardware. Apple’s current business model showcases the hardware problem, bringing out new devices every year to keep up with ever-advancing technology and frequently changing functionalities. Each device has started to become a costly expense rather than an investment in cutting-edge technology, to the point where new phones significantly depreciate within a couple of years and become practically worthless within five. When the iPhone 4 launched, video content could only be played for around an hour before the battery died. This led to the development of new processors, which enabled people to view their favourite videos for several hours, and the same thing will have to happen with advancing computer vision. Today’s smartphones would require an upgrade of bleeding-edge technology to enable AR to run in real-time, live and at 30 frames per second. As such, we need to face the incredibly difficult task of optimisation for high-performance computing and creating a whole new ‘device’ which will support this whilst still being slender and functional enough to seamlessly integrate into people’s everyday lives. It’s time to face the future of communication; a more connected, digital and social relationship enabled by the advancement of AR, not inhibited by the expensive and limiting restraints of outdated hardware. We’ll be entering the age of the ‘sci-fi movie’ where things we’ve seen in films over the years start to become reality. Rather than navigating the streets using Google Maps, apps equipped with computer vision will throw AR directions up right before our eyes, displayed as if laid out on the street in front of us. As for what type of ‘phone’ we’ll rely on when AR sets in, it’s hard to say for sure. 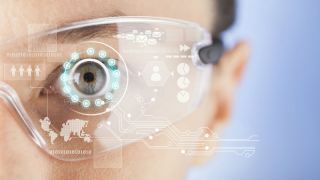 We’re preparing for a time when smart devices as we know them cease to exist, so expect something totally different from what we use today; potentially advanced glasses or contact lenses, all with a focus on camera-centric apps. In short, when AR devices become the standard, our lives will change dramatically. Devices will become far more intuitive and our interaction with technology will be much smoother, paving the way for innovative new business practices, consumer behaviour and educational resources. While research shows that people currently spend up to a day a week online via mobile technology, AR devices will transform the way in which we communicate, freeing up our hands for a more immersive experience. However, regardless of how our mobile devices evolve, there is zero doubt that exciting and transformative change is afoot and, eventually, physical devices as we know them will disappear altogether.